Alcohol is a hypnotic-sedative, and as such, it depresses crucial bodily functions when taken in excess. Mixing alcohol and antidepressants is generally not recommended for several reasons. The medications can worsen the effects of alcohol, while alcohol can worsen antidepressant side effects. In some cases, alcohol use can trigger or worsen symptoms of depression in at-risk individuals. But is it always dangerous to mix alcohol and antidepressants, and is completely abstaining from alcohol the only option for people on antidepressants? The following article will explore how alcohol and antidepressants affect people when the two are mixed. What happens when you drink alcohol while taking antidepressants? There are several different types of antidepressant medications on the market. Each one affects crucial neurotransmitters and neural processes differently in the treatment of depression. Millions of Americans take antidepressants, with one in six of people over age 60 taking medicine for depression. Generally, drinking alcohol while taking antidepressants is not advised. Alcohol can make depression worse, and also increase the severity of antidepressant side effects. It’s generally recommended that people on antidepressants abstain from alcohol, especially if they will be driving or operating heavy machinery. How does alcohol affect the different types of antidepressant medications? SSRIs, or selective serotonin reuptake inhibitors don’t usually cause problems if someone drinks while taking them. But, these medications can make patients drowsy, and alcohol can intensify this effect. TCAs can make people feel tired or uncoordinated. These side effects are most pronounced during the first few weeks after someone starts taking the medications. It’s not a good idea to drink soon after starting on TCA medications for depression. Several weeks after side effects have subsided, though, it’s generally considered safe to drink small amounts of alcohol. Tyramine, a substance found in some beers, wines, and sherry, can cause serious side effects if someone drinks while on an MAOI. Side effects include a sudden, dangerous increase in blood pressure. It is generally advised that people avoid alcohol if they are on an MAOI. Tyramine is also found in certain foods. People who take an MAOI need to be particularly careful with their diet. Other antidepressant drugs do not cause any severe problems with alcohol. But, they can make a person very drowsy or sleepy if they mix the two. What are the most significant dangers of mixing antidepressants and alcohol? Drinking can prevent antidepressant medications from working correctly. Drinking can make depression symptoms more severe and harder to treat. Although alcohol can improve mood in the short term, the risk of creating long-term problems is a risk that people on antidepressants should avoid taking. If someone takes an antidepressant and another prescription medication for a different health problem at the same time, alcohol can significantly increase the side effects of both medications. For people on MAOIs, alcohol can cause dangerous, potentially deadly increases in blood pressure. People on MAOIs should avoid all alcoholic drinks that are likely to cause this reaction. For people on MAOIs, it’s important to discuss with their doctor what foods and drinks are safe to consume while taking the medication. Alcohol and antidepressants can impair a person’s coordination, and cause confusion and severe drowsiness. People can fall and injure themselves, and it’s best to avoid driving or operating machinery if someone drinks while on any type of antidepressant. Even if a person’s BAC is far under the legal limit, alcohol mixed with an antidepressant will intensify feelings of drowsiness and loss of coordination. Is mixing alcohol with antidepressants a sign of alcoholism? In some cases, mixing these two substances can be a sign of a deeper problem. People with untreated depression are at an increased risk of drug abuse or alcohol abuse and addiction. An untreated alcohol abuse disorder can lead someone to mix their medications to get “high” or escape from emotional pain. If someone is on medication and drinks despite the dangers, they need help for alcohol abuse disorder. Any time someone uses a prescription medicine for something other than what it is intended for, it is considered substance abuse and is a cause for concern. People who are on antidepressants and are struggling with alcohol use disorder are at risk of stopping their medications so they can drink more. Sudden withdrawal from antidepressants can cause serious physical side effects, and in the worst of cases, it can cause seizures. Abrupt cessation can also trigger a worsening of depression symptoms. People with depression who abuse alcohol are at high risk of suicide and self-harm. Who is at risk of mixing alcohol and antidepressants? People with an untreated substance abuse disorder or depression that is not responding to medication are at high risk of abusing alcohol and their prescription medications. Also, mixing alcohol with antidepressants can make someone incredibly sleepy. People with an untreated sleeping disorder may mix their antidepressants with alcohol to find relief. This risky behavior can lead to more serious problems in the future. Is there always a danger when mixing alcohol and antidepressants? Not always. Some antidepressant medications do not interact dangerously with alcohol. Also, light drinking on some prescriptions, such as TCAs, is not necessarily dangerous after several weeks have passed on the new medication. When is mixing drugs and alcohol a problem, and where can someone go for help? 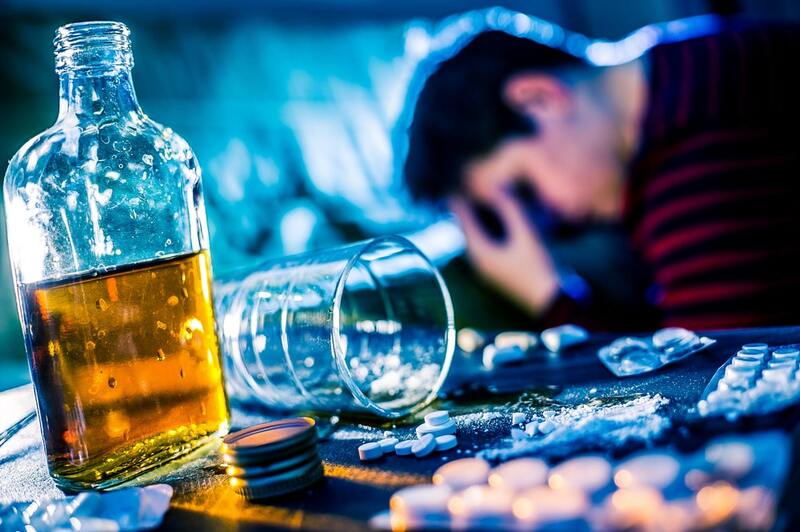 If someone is mixing alcohol with antidepressants to get “high,” or experiencing other adverse consequences from combining the two substances, they will need help from a qualified alcohol abuse counselor. When someone engages in risky behavior despite the consequences, it is a sign of an addiction problem. An inpatient rehab center will be able to address alcohol abuse while still assisting the patient with their depressive symptoms. Medical detox centers and inpatient rehabilitation facilities are staffed with trained medical doctors who can monitor a patient’s antidepressant use and assist them in managing their depression. For people with depression who struggle with alcohol use disorder, it’s crucial that they receive integrated care both during and after treatment. Inpatient rehab centers give people access to trained, qualified therapists and a support network. If you are struggling with depression and alcohol abuse, please reach out to an addiction counselor today.